You have probably heard about the Raw Food Diet. There are a lot of different variations on the Raw Food Diet depending upon the person advocating it. The basic and common feature of most raw food diets is that they all advocate eating food in their natural state – that is, uncooked, unprocessed, organic and unexposed to herbicides and pesticides. What does a raw food diet include? Some include unprocessed nuts and uncooked grains. Other raw food diets include eggs, milk, cheese and raw fish (sushi and sashimi). 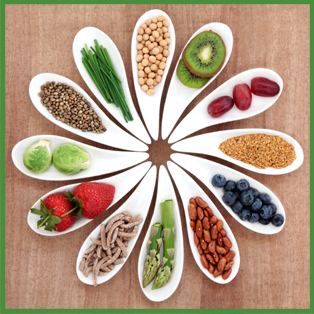 Then there is just the simple action of eating lots of raw fruits and vegetables to retain all their nutrients. One example of this is the juicing lifestyle, where fresh homemade juices are made from both vegetables and fruits are the mainstay of one’s daily intake. The main purpose of most people who shift to a raw food diet is for weight loss. It is true – eating raw food will facilitate weight loss because eating raw food will mean that you won’t consume as much fat and calories as with a regular diet. Another main purpose of most people who shift to a raw food diet is to fight what is referred to as lifestyle diseases. Lifestyle diseases include hypertension, coronary artery disease and diabetes. These lifestyle diseases are often caused by eating food that is too high on fat, sugar and cholesterol. Some who go on a raw food diet do so because they want to avoid the accumulation of harmful chemicals in their bodies from food that is exposed to pesticides, herbicides, antibiotics and hormones. Fruits and vegetables grown in commercial farms are usually treated with pesticides and herbicides to keep insects from feasting on the fruits and vegetables. Livestock, pork and chicken grown commercially are treated with hormones and antibiotics to prevent disease and ensure optimal growth. Seedless fruit are sprayed with hormones as well. Still some people who opt for a raw food diet emphasize a healthy lifestyle that will keep them looking young. They believe that fresh, unprocessed fruits, vegetables and grains boost the immune system which keeps infectious diseases at bay and it improves the body’s circulation and systemic functioning which gives them clear skin and radiant hair. Is It Easy To Maintain A Diet Of Raw Food? As with all diets, you must consult your doctor to see if you may shift to a raw food diet. And if you do shift to a raw food diet, perhaps it is best to do it gradually. Start with juicing an assortment of fruits and vegetables to replace colas and desserts. Replace your regular cooked meals gradually with a wide assortment of salads and grains and nuts. The most difficult thing about going on a raw food diet is sourcing raw, unprocessed and chemical-free food. If you like going out to eat, you will find it difficult to find restaurants that serve only raw food. The next difficult thing is in preparing the food—it is time consuming. It is easy enough to simply peel a banana or eat an apple for a snack but if you have to subsist on fruits and veggies, you will have to carry fresh fruits and vegetables with you throughout the day. Another problem most people encounter with the raw food diet is that food grown organically is more expensive. Also there is a real danger of malnutrition as there are nutrients and minerals which you cannot get from uncooked fruits, vegetables and whole grains. You will have to take a vitamin or food supplement for this. You will have to eat fruits and vegetables that are unfamiliar to you. The texture of uncooked food may be difficult to get used to at first. For those who advocate eating raw fish, eggs, milk and milk products, you might need to conquer your gag reflex first. There is also a real danger of food poisoning from food that is unpasteurized such as milk and milk products, so one needs to take care, though these days it is not as problematic since the there are many quality controls in place. Shifting to a raw food diet requires a lifestyle change as well as a change in mindset. It will not work for everyone and some people can follow a raw food diet but not strictly. Ask your physician first. There are so many benefits to eating raw food and one thing to keep in mind is that it need not be exclusive of other food, you can simply add more fresh, and raw fruits and vegetables to your diet on a daily basis and cut out processed foods. That alone is a huge step to improving your health, preventing disease and curtailing the effects of aging.